This loaded Ford F150 SuperCrew is a great value. Drive it today! 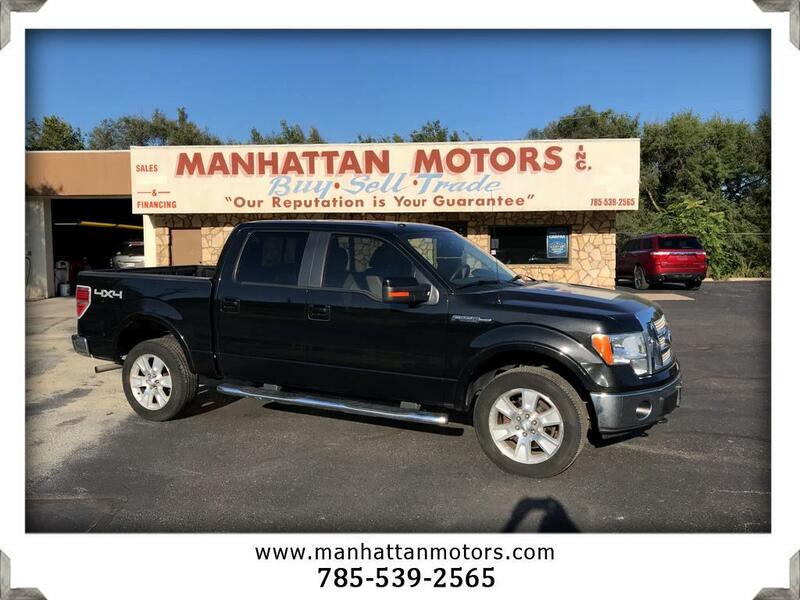 Step up to power and luxury in our Accident Free 2010 Ford F-150 Lariat SuperCrew 4X4 that's handsome in Tuxedo Black! Powering our truck is a robust 5.4 Liter V8 paired with a 6 Speed Automatic transmission. This phenomenal Four Wheel Drive combination takes you down the road with authority, scoring near 20mpg along the way. You can tackle your toughest tasks with style, as the exterior is enhanced by chrome tubular step bars, a power sliding rear window, fog lamps, chrome bumpers/grille, rear privacy glass, bright wheels, bedliner, tailgate step, and a trailer hitch receiver. Open the door to find that the spacious cabin greets you with power-adjustable heated and ventilated leather front seats with driver memory, power-adjustable pedals, full power accessories, woodgrain trim, a leather-wrapped steering wheel with mounted controls, dual-zone automatic climate control, SYNC voice-activated communications, premium audio with available Sirius radio, Bluetooth, and other features that make each ride feel fantastic. Of course, Ford has a sterling reputation for security and quality that you can count on. Drive with confidence knowing our Lariat is well-equipped with a rear view camera, airbags, stability/traction control, ABS, available SOS post-crash alert, and a tire-pressure monitor. Our F-150 checks off all the boxes on your list and may be the best decision you'll make this year with its ideal blend of capability, style, luxury and security. Print this page and call us Now... We Know You Will Enjoy Your Test Drive Towards Ownership! Thanks for choosing Manhattan Motors. We recently won The Manhattan Mercury Readers' Choice Award for being the #1 Used Car Dealer. Buyers enjoy our "laid back" approach. No test drive routes or high-pressure salesmen. Our focus is to offer all of the information you need to help make the best decision for your family or business. Each one of our vehicles undergoes a 30-point vehicle inspection by Burnett Automotive, Manhattan's #1 Auto Service Facility. We are also the area's only Independent USAA Certified Dealer, offering discounts on purchases and interest rates.